Just about everyone has a too-small bathroom. If you’re lucky, it’s an “extra” one that you can use as a powder room or seldom-used guest bathroom. But for most regular folk, that bathroom is an important one. The experts advise pedestal sinks and consoles to give the room an open feel. Which is a great idea, provided you don’t need anything more than minimal storage space. If you do need that space (and badly! 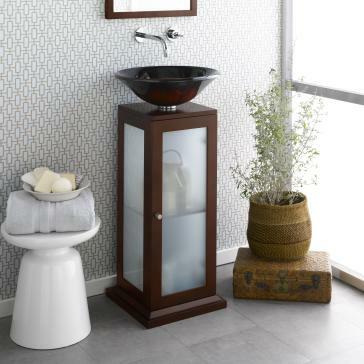 ), consider a small vanity – many measure under 18″ – to provide much-needed storage in the same amount of space that a pedestal would consume. If your bathroom has the proper structure for a wall-mount, that may be your perfect solution. Just be aware that wall-mounted vanities physically cannot provide the same amount of storage space as floor-mount vanities of similar widths, so if a wall-mount meets your storage needs adequately, go for it! The style will give the room an illusion of openness thanks to the cleared floor space. How do you store your stuff in a space-challenged bathroom?